Peter Vincenti's late strike helped Rochdale secure a hard-fought victory over Scunthorpe at Spotland. In a tight first half, Tom Hooper nearly opened the scoring for the Iron but his driven shot was saved by keeper Josh Lillis. After the visitors' Kevin Van Veen hit the crossbar, Joe Bunney's drive put the home side ahead. Murray Wallace's header equalised for Scunthorpe but Vincenti rifled home to seal the win for Rochdale. "I think performances get forgotten about. It was important that we responded as a team to last week (losing at Burton) because last week was a psychological disappointment in the manner that we didn't perform. "If we perform well and we lose games, you remain confident. "Last week we went too far away from our DNA and our template of the way we want to play, it's taken a lot of rescuing this week." "There was nothing in the game really between the two teams. I think we defended pretty well and they've defended pretty well and restricted play to the middle third of the pitch. "We've hit the bar, we've had some good attempts on goal, we've scored a goal from a corner and we've done ok. It's come down to defending a cross in the final five minutes of the game which is disappointing. "We've got to dust ourselves down, get on with things and prepare for the game next week away at Southend and can we get our first away win there." Match ends, Rochdale 2, Scunthorpe United 1. Second Half ends, Rochdale 2, Scunthorpe United 1. Attempt missed. Peter Vincenti (Rochdale) header from the right side of the box misses to the left following a corner. Corner, Rochdale. Conceded by Jack King. Attempt missed. Joe Bunney (Rochdale) right footed shot from outside the box misses to the left. Substitution, Scunthorpe United. David Syers replaces Jamie Ness. Goal! Rochdale 2, Scunthorpe United 1. 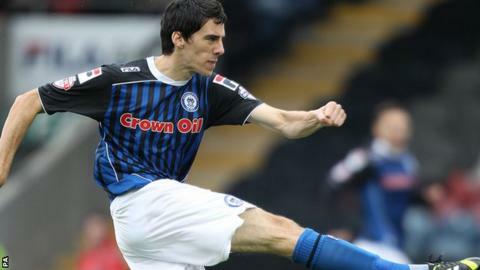 Peter Vincenti (Rochdale) right footed shot from the right side of the six yard box to the bottom right corner. Assisted by Tom Kennedy with a cross. Tom Kennedy (Rochdale) wins a free kick in the attacking half. Foul by Darius Henderson (Scunthorpe United). Goal! Rochdale 1, Scunthorpe United 1. Murray Wallace (Scunthorpe United) header from very close range to the high centre of the goal. Assisted by Gary McSheffrey with a cross following a corner. Corner, Scunthorpe United. Conceded by Joseph Rafferty. Substitution, Rochdale. Joseph Rafferty replaces Andrew Cannon because of an injury. Jack King (Scunthorpe United) wins a free kick on the left wing. Substitution, Scunthorpe United. Hakeeb Adelakun replaces Kevin van Veen. Attempt saved. Peter Vincenti (Rochdale) header from the right side of the box is saved in the bottom right corner. Goal! Rochdale 1, Scunthorpe United 0. Joe Bunney (Rochdale) left footed shot from outside the box to the bottom left corner. Assisted by Andrew Cannon. Oliver Lancashire (Rochdale) wins a free kick in the defensive half. Substitution, Rochdale. Joe Bunney replaces Reuben Noble-Lazarus. Substitution, Rochdale. Calvin Andrew replaces Donal McDermott. Attempt saved. Kevin van Veen (Scunthorpe United) left footed shot from outside the box is saved in the bottom left corner. Hand ball by Donal McDermott (Rochdale). Tom Hopper (Scunthorpe United) is shown the yellow card for a bad foul. Paddy Madden (Scunthorpe United) hits the bar with a right footed shot from the right side of the box. Second Half begins Rochdale 0, Scunthorpe United 0.